Summer is preferably the time when I am busy in the lab planning the upcoming winter holiday season - and the most fun part of it is R&D for new products. One of those you've read about yesterday (Lovender deodorant). 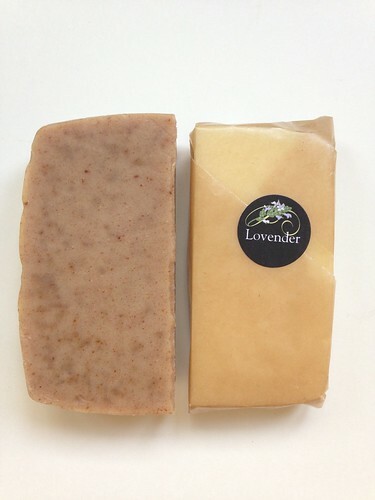 Today I'm sharing with you the Lovender soap which I've created with Schuyler Corry of Open Source Soap. That is to say: I've created the scent, and he incorporated it into one of his wonderful, tried-and-true soap formulae. With soaps, it's rarely possible to use the same formula as was created for the perfume, simply because of the costs. 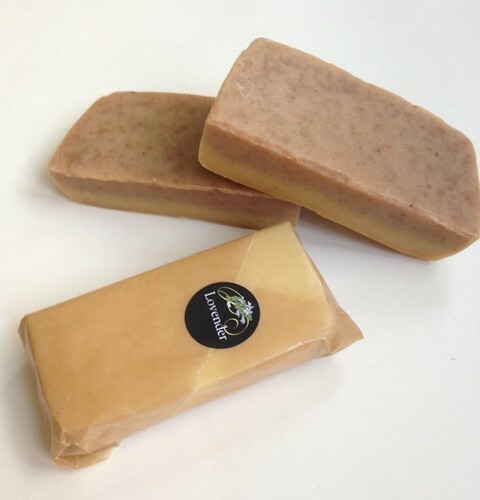 You need a whack load of raw materials to make a batch of soap, even if it is just at about 2% concentration. Lovender perfume included precious botanicals such as sandalwood oil (almost extinct at our day and age), vanilla absolute (whose prices doubled this year due to low yield) and orris butter (one of the world's costliest raw materials, due to the fact that it takes 3 years to obtain the finished product from planting through meticulous processing and aging to extraction). To make up for their absence, I've used amyris oil (AKA West Indian sandalwood), a combination of other vanilla-smelling resins and balsams, and orris powder instead of the orris butter. Using botanicals in soaps is always bound to produce surprises. For example: the bottom layer of the batch looked like it had two layers of colours. The lighter one at the bottom didn't have any of the orris powder in it at all. The orris gives it a gentle exfoliation, by the way. Also, despite the fact that it is with the same moisurizing formulae like we always had, this leaves my skin feeling cleaner but also a tad drier. Not so bad that I needed a moisturizer though. But it was noticeable. I also wanted to create a somewhat tonka-bean like, foody effect by utilizing a brand new essence on my palette: bitter almond oil. This raw material is practically pure benzaldehyde. I had no idea how it would react to the saponification process, and I also didn't know how it will play out with the lavender essences. I smelled bitter almond in soaps before, and it was quite prominent, which was a hint to me that it would probably work. I was hoping it would also help to make up for the absence of vanilla absolute and also create an original combination. Turns out it worked quite lovely with the coumarin aspect of the lavender absolute. So it truly accentuates it. I may want to work more on this formulation for the next batch (we only make 14 soap bars in each batch, so that gives a bit of fiddle room and also makes mistakes not as grave as they could be). So I will likely fiddle with both the fragrance formula and also try it again with and without the orris root powder, just to see and smell what it would be like.